Myelodysplastic syndrome (MDS) refers to a heterogeneous group of closely related clonal hematopoietic disorders commonly found in the aging population. All are characterized by one or more peripheral blood cytopenias. 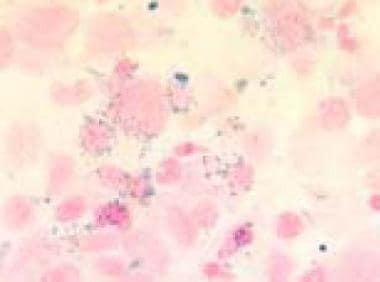 Bone marrow is usually hypercellular, but rarely, a hypocellular marrow mimicking aplastic anemia may be seen. Bone marrow cells display aberrant morphology and maturation (dysmyelopoiesis), resulting in ineffective blood cell production. MDS affects hematopoiesis at the stem cell level, as indicated by cytogenetic abnormalities, molecular mutations, and morphologic and physiologic abnormalities in maturation and differentiation of one or more of the hematopoietic cell lines. [1, 2, 3] See the image below. Blood film (1000× magnification) demonstrating a vacuolated blast in a refractory anemia with excess of blasts in transformation. Courtesy of U. Woermann, MD, Division of Instructional Media, Institute for Medical Education, University of Bern, Switzerland. MDS may involve one, two, or all three myeloid hematopoiesis cell lineages—erythrocytic, granulocytic, megakaryocytic—depending on the subtype and stage of the disease. The heterogeneity of MDS reflects the fact that its course involves a series of cytogenetic events. In a subgroup of patients, the acquisition of additional genetic abnormalities results in the transformation of MDS into acute myeloid leukemia (AML). Thus, although MDS is clonal, it is considered a premalignant condition. Patients with MDS may present with clinical manifestations of anemia, thrombocytopenia, and/or neutropenia (see Presentation). The workup in patients with possible MDS includes a complete blood count with differential, peripheral blood smear, and bone marrow studies (see Workup). For discussion of MDS in children, see Pediatric Myelodysplastic Syndrome. MDS can be classified as primary (de novo) or secondary to aggressive treatment of other cancers, with exposure to radiation, alkylating agents, or topoisomerase II inhibitors; it also occurs in heavily pretreated patients with autologous bone marrow transplants. In the early stages of MDS, the main cause of cytopenias is increased apoptosis (programmed cell death). As the disease progresses and converts into leukemia, further gene mutation occurs, and a proliferation of leukemic cells overwhelms the healthy marrow. Patients with complex karyotypes constitute 30% of primary MDS cases (only 20% of de novo AML) and up to 50% of therapy-related MDS and AML cases. These patients have a worse prognosis and response to treatment. Balanced translocation abnormalities lead to the generation of fusion oncogenes such as Bcr-Abl in chronic myelogenous leukemia (CML) and PML-Rar alpha in acute promyelocytic leukemia (APL). Unbalanced recurrent aberrations, most commonly -5, 5q-,-7, 7q-, +8, 11q-, 13q-, and 20q-, suggest that genes within these regions have a role in the pathogenesis of MDS or myeloproliferative disorder (MPD), which is based on loss of tumor suppressor genes or haploinsufficiency of genes necessary for normal myelopoiesis. Approximately 80% of patients with MDS do not have an obvious exposure or cause for MDS. In these cases, the disorder is classified as primary or idiopathic MDS. The World Health Organiztion (WHO) classifies secondary MDS as MDS or acute leukemia that develops years after known exposure to sources of chromosomal damage. Patients who survive cancer treatment with alkylating agents, with or without radiotherapy, have a high risk of developing MDS or secondary acute leukemia 5-7 years after the exposure. These drugs are associated with a high prevalence of chromosomal abnormalities in bone marrow—in particular, the -5, del(5q), -7, del(q) and complex karyotype. Secondary MDS after treatment with a topoisomerase II inhibitors such as an anthracycline or etoposide occurs 1-3 years after exposure to these agents. The chromosomal abnormalities commonly involve the MLL gene (11q23). MDS may also develop after exposure to certain chemicals (eg, benzene). Insecticides, weed killers, and fungicides are also possible causes of MDS and secondary leukemia. Viral infections have also been implicated. Less evidence supports genetic predisposition, but familial incidences have been described. Some of the congenital platelet disorders with RUNX1 and GATA2 mutations can predispose to MDS. Although familial cases of myelodysplastic syndromes are rare, they are immensely valuable for the investigation of the molecular pathogenesis of myelodysplasia in general. The best-characterized familial MDS is familial platelet disorder with propensity to myeloid malignancy, which is caused by heterozygous germline RUNX1 mutations. The incidence of MDS/AML in affected pedigrees is over 40%, with a median age of onset of 33 years. Familial monosomy 7; unusually short telomeres in dyskeratosis congenita; and four pedigrees with inherited MDS caused by heterozygous mutations in GATA2 have been reported. These familial forms may occasionally be found in the course of screening family members of a patient with MDS as bone marrow transplant donors. Although MDS may occur in persons of any age, including children, MDS primarily affects elderly people, with the median onset in the seventh decade of life. Data from 2001 through 2003 of the first National Cancer Institute's Surveillance, Epidemiology & End Reports (SEER) indicate 86% of MDS cases were diagnosed in individuals who were 60 years of age or older (median age: 76y). Other data from SEER also show that the estimated incidence of MDS increases significantly with age, ranging from 0.7 per 100,000 population during the fourth decade of life to 20.8-36.3/100,000 after age 70 years. There is a fivefold difference in risk between age 60 and ≥80 years. In some patients, MDS is an indolent disease. Other patients develop significant cytopenias; the resulting complications (eg, bleeding and infections) account for almost all the mortality related to MDS. In the remainder of cases the disease follows an aggressive course and converts into an acute form of leukemia. Risk classification systems to estimate prognosis in patients with MDS have been developed by the French-American-British (FAB) Cooperative Group, the World Health Organization (WHO), and the MDS Risk Analysis Workshop. An underlying trilineage dysplastic change in the bone marrow cells is found in all subtypes. Bone marrow film (1000× magnification) demonstrating ring sideroblasts in Prussian blue staining in a refractory anemia with excess of blasts in transformation. Courtesy of U. Woermann, MD, Division of Instructional Media, Institute for Medical Education, University of Bern, Switzerland. 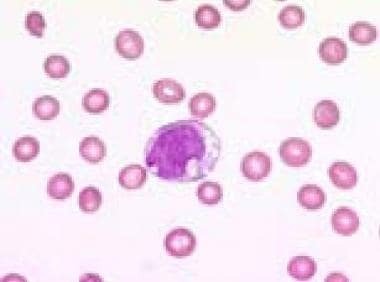 RAEB and RAEB-T (see the image below) are characterized by greater than 5% myeloblasts. The higher the percentage of myeloblasts present, the shorter the clinical course and the closer the disease is to acute myelogenous leukemia. Transition from early to more advanced stages may occur, which indicates that these subtypes are merely stages of disease rather than distinct entities. Elderly patients with MDS who progress to acute leukemia are often considered to have a poor prognosis because their disease response to chemotherapy is worse than that of de novo acute myeloid leukemia patients. The 1999 WHO classification proposed including all cases of RAEB-T in the category of acute leukemia because these patients have similar prognostic outcomes. However, the response to therapy is worse than in patients with de novo or more typical AML or acute nonlymphocytic leukemia. The fifth type of MDS, CMML, is the most difficult to classify. This subtype can have any percentage of myeloblasts but manifests as a monocytosis of 1000/μL or more, a total white blood cell (WBC) count of less than 13,000/μL, and trilineage dysplasia. CMML may be associated with splenomegaly. This subtype overlaps with myeloproliferative disease (MPD) and may have an intermediate clinical course. CMML must be differentiated from classic chronic myelocytic leukemia, which is characterized by a negative Ph chromosome. The 2008 WHO classification proposed that juvenile myelomonocytic leukemia and CMML be listed as separate entities within a group of myelodysplastic/myeloproliferative neoplasm (MDS/MPN) overlap syndromes. WHO criteria for these forms of CMML include splenomegaly and a WBC count greater than 13,000/μL. The WHO classification also includes provisional category of refractory cytopenia of childhood, with cytopenias and < 2% blasts in peripheral blood and, in bone marrow, dysplasia in 1–3 lineages and < 5% blasts. Besa EC. Myelodysplastic syndromes (refractory anemia). A perspective of the biologic, clinical, and therapeutic issues. Med Clin North Am. 1992 May. 76(3):599-617. [Medline]. Germing U, Kobbe G, Haas R, Gattermann N. Myelodysplastic syndromes: diagnosis, prognosis, and treatment. Dtsch Arztebl Int. 2013 Nov 15. 110(46):783-90. [Medline]. Dao KT. Myelodysplastic Syndromes: Updates and Nuances. Med Clin North Am. 2017 Mar. 101 (2):333-350. [Medline]. Goldberg H, Lusk E, Moore J, Nowell PC, Besa EC. Survey of exposure to genotoxic agents in primary myelodysplastic syndrome: correlation with chromosome patterns and data on patients without hematological disease. Cancer Res. 1990 Nov 1. 50(21):6876-81. [Medline]. [Full Text]. Sperling AS, Gibson CJ, Ebert BL. The genetics of myelodysplastic syndrome: from clonal haematopoiesis to secondary leukaemia. Nat Rev Cancer. 2017 Jan. 17 (1):5-19. [Medline]. [Full Text]. Kristinsson SY, Bjorkholm M, Hultcrantz M, et al. Chronic immune stimulation might act as a trigger for the development of acute myeloid leukemia or myelodysplastic syndromes. J Clin Oncol. 2011 Jul 20. 29(21):2897-903. [Medline]. [Full Text]. Bejar R, Steensma DP. Recent developments in myelodysplastic syndromes. Blood. 2014 Oct 30. 124 (18):2793-803. [Medline]. [Full Text]. What are the key statistics about myelodysplastic syndromes?. American Cancer Society. Available at http://www.cancer.org/cancer/myelodysplasticsyndrome/detailedguide/myelodysplastic-syndromes-key-statistics. January 22, 2018; Accessed: February 28, 2018. Rollison DE, Hayat M, Smith M, et al. First report of national estimates of the incidence of myelodysplastic syndromes and chronic myeloproliferative disorders from the U.S. SEER program [abstract 247]. Blood. 2006. 108:77a. [Full Text]. Rollison DE, Howlader N, Smith MT, et al. Epidemiology of myelodysplastic syndromes and chronic myeloproliferative disorders in the United States, 2001-2004, using data from the NAACCR and SEER programs. Blood. 2008 Jul 1. 112(1):45-52. [Medline]. [Full Text]. Ma X. Epidemiology of myelodysplastic syndromes. Am J Med. 2012 Jul. 125 (7 Suppl):S2-5. [Medline]. Ma X, Does M, Raza A, Mayne ST. Myelodysplastic syndromes: incidence and survival in the United States. Cancer. 2007 Apr 15. 109(8):1536-42. [Medline]. [Full Text]. Roman E, Smith A, Appleton S, Crouch S, Kelly R, Kinsey S, et al. Myeloid malignancies in the real-world: Occurrence, progression and survival in the UK's population-based Haematological Malignancy Research Network 2004-15. Cancer Epidemiol. 2016 Apr 15. [Medline]. [Full Text]. Harris NL, Jaffe ES, Diebold J, Flandrin G, Muller-Hermelink HK, Vardiman J, et al. World Health Organization classification of neoplastic diseases of the hematopoietic and lymphoid tissues: report of the Clinical Advisory Committee meeting-Airlie House, Virginia, November 1997. J Clin Oncol. 1999 Dec. 17(12):3835-49. [Medline]. [Full Text]. Greenberg P, Cox C, LeBeau MM, et al. International scoring system for evaluating prognosis in myelodysplastic syndromes. Blood. 1997 Mar 15. 89(6):2079-88. [Medline]. [Full Text]. Greenberg PL, Tuechler H, Schanz J, Sanz G, Garcia-Manero G, et al. Revised international prognostic scoring system for myelodysplastic syndromes. Blood. 2012 Sep 20. 120 (12):2454-65. [Medline]. [Full Text]. Adema V, Bejar R. What lies beyond del(5q) in myelodysplastic syndrome?. Haematologica. 2013 Dec. 98(12):1819-21. [Medline]. Molldrem JJ, Leifer E, Bahceci E, et al. Antithymocyte globulin for treatment of the bone marrow failure associated with myelodysplastic syndromes. Ann Intern Med. 2002 Aug 6. 137(3):156-63. [Medline]. [Full Text]. Angelucci E, Urru SA, Pilo F, Piperno A. Myelodysplastic Syndromes and Iron Chelation Therapy. Mediterr J Hematol Infect Dis. 2017. 9 (1):e2017021. [Medline]. [Full Text]. [Guideline] Bennett JM, MDS Foundation's Working Group on Transfusional Iron Overload. Consensus statement on iron overload in myelodysplastic syndromes. Am J Hematol. 2008 Nov. 83 (11):858-61. [Medline]. [Full Text]. Musto P, Lanza F, Balleari E, et al. Darbepoetin alpha for the treatment of anaemia in low-intermediate risk myelodysplastic syndromes. Br J Haematol. 2005 Jan. 128(2):204-9. [Medline]. [Guideline] NCCN Clinical Practice Guidelines in Oncology. Myelodysplastic Syndromes. National Comprehensive Cancer Network. Available at http://www.nccn.org/professionals/physician_gls/pdf/mds.pdf. Version 1.2019 — July 16, 2018; Accessed: July 23, 20018. Jadersten M, Montgomery SM, Dybedal I, Porwit-MacDonald A, Hellstrom-Lindberg E. Long-term outcome of treatment of anemia in MDS with erythropoietin and G-CSF. Blood. 2005 Aug 1. 106(3):803-11. [Medline]. [Full Text]. Clark RE, Jacobs A, Lush CJ, Smith SA. Effect of 13-cis-retinoic acid on survival of patients with myelodysplastic syndrome. Lancet. 1987 Apr 4. 1 (8536):763-5. [Medline]. Crisà E, Foli C, Passera R, Darbesio A, Garvey KB, Boccadoro M, et al. Long-term follow-up of myelodysplastic syndrome patients with moderate/severe anaemia receiving human recombinant erythropoietin + 13-cis-retinoic acid and dihydroxylated vitamin D3: independent positive impact of erythroid response on survival. Br J Haematol. 2012 Jul. 158 (1):99-107. [Medline]. List A, Dewald G, Bennett J, Giagounidis A, Raza A, Feldman E, et al. Lenalidomide in the myelodysplastic syndrome with chromosome 5q deletion. N Engl J Med. 2006 Oct 5. 355 (14):1456-65. [Medline]. [Full Text]. List A, Kurtin S, Roe DJ, et al. Efficacy of lenalidomide in myelodysplastic syndromes. N Engl J Med. 2005 Feb 10. 352(6):549-57. [Medline]. [Full Text]. Silverman LR, Demakos EP, Peterson BL, et al. Randomized controlled trial of azacitidine in patients with the myelodysplastic syndrome: a study of the cancer and leukemia group B. J Clin Oncol. 2002 May 15. 20(10):2429-40. [Medline]. [Full Text]. Fenaux P, Mufti GJ, Hellstrom-Lindberg E, et al. Efficacy of azacitidine compared with that of conventional care regimens in the treatment of higher-risk myelodysplastic syndromes: a randomised, open-label, phase III study. Lancet Oncol. 2009 Mar. 10(3):223-32. [Medline]. Bejar R, Lord A, Stevenson K, Bar-Natan M, Pérez-Ladaga A, Zaneveld J, et al. TET2 mutations predict response to hypomethylating agents in myelodysplastic syndrome patients. Blood. 2014 Oct 23. 124 (17):2705-12. [Medline]. [Full Text]. Parikh AR, Olnes MJ, Barrett AJ. Immunomodulatory treatment of myelodysplastic syndromes: antithymocyte globulin, cyclosporine, and alemtuzumab. Semin Hematol. 2012 Oct. 49 (4):304-11. [Medline]. [Full Text]. Platzbecker U. Who benefits from allogeneic transplantation for myelodysplastic syndromes? : new insights. Hematology Am Soc Hematol Educ Program. 2013. 2013:522-8. [Medline]. Sandhu KS, Brunstein C, DeFor T, Bejanyan N, Arora M, Warlick E, et al. Umbilical Cord Blood Transplantation Outcomes in Acute Myelogenous Leukemia/Myelodysplastic Syndrome Patients Aged ≥70 Years. Biol Blood Marrow Transplant. 2015 Sep 28. [Medline]. Shaffer BC, Ahn KW, Hu ZH, Nishihori T, Malone AK, et al. Scoring System Prognostic of Outcome in Patients Undergoing Allogeneic Hematopoietic Cell Transplantation for Myelodysplastic Syndrome. J Clin Oncol. 2016 Apr 4. [Medline]. Lindsley RC, Saber W, Mar BG, Redd R, Wang T, Haagenson MD, et al. Prognostic Mutations in Myelodysplastic Syndrome after Stem-Cell Transplantation. N Engl J Med. 2017 Feb 9. 376 (6):536-547. [Medline]. [Full Text]. [Guideline] Fenaux P, Haase D, Sanz GF, Santini V, Buske C, ESMO Guidelines Working Group. Myelodysplastic syndromes: ESMO Clinical Practice Guidelines for diagnosis, treatment and follow-up. Ann Oncol. 2014 Sep. 25 Suppl 3:iii57-69. [Medline]. [Full Text]. [Guideline] Malcovati L, Hellström-Lindberg E, Bowen D, et al. Diagnosis and treatment of primary myelodysplastic syndromes in adults: recommendations from the European LeukemiaNet. Blood. 2013 Oct 24. 122 (17):2943-64. [Medline]. [Full Text]. Malcovati L, Porta MG, Pascutto C, Invernizzi R, Boni M, Travaglino E, et al. Prognostic factors and life expectancy in myelodysplastic syndromes classified according to WHO criteria: a basis for clinical decision making. J Clin Oncol. 2005 Oct 20. 23 (30):7594-603. [Medline]. [Full Text]. Malcovati L, Della Porta MG, Strupp C, Ambaglio I, Kuendgen A, Nachtkamp K, et al. Impact of the degree of anemia on the outcome of patients with myelodysplastic syndrome and its integration into the WHO classification-based Prognostic Scoring System (WPSS). Haematologica. 2011 Oct. 96 (10):1433-40. [Medline]. [Full Text]. Garcia-Manero G, Shan J, Faderl S, Cortes J, Ravandi F, Borthakur G, et al. A prognostic score for patients with lower risk myelodysplastic syndrome. Leukemia. 2008 Mar. 22 (3):538-43. [Medline]. [Full Text]. Myelodysplastic Syndromes Treatment (PDQ®)–Health Professional Version. National Cancer Institute. Available at http://www.cancer.gov/cancertopics/pdq/treatment/myelodysplastic/HealthProfessional/page1#Reference1.9. April 2, 2015; Accessed: November 20, 2017. Saunthararajah Y. Key clinical observations after 5-azacytidine and decitabine treatment of myelodysplastic syndromes suggest practical solutions for better outcomes. Hematology Am Soc Hematol Educ Program. 2013. 2013:511-21. [Medline]. Visor MT, et.al. Revised International Prognostic Scoring System (IPSS) Predicts survival and Leukemia Evaluation of Myelodysplastic Syndromes Significantly Better than IPSS and WHO Prognostic System: Validation by the Gruppo Romano Mielodisplasie Italian Regional Database. Journal of Clinical Oncology. 2013. 31:2671-2677. Liew E, and Owen C. Familial myelodysplastic syndromes: a review of literature. Haematologica. 2011. 10:1536-1542. This bone marrow film (400× magnification) demonstrates an almost complete replacement of normal hematopoiesis by blasts in a refractory anemia with an excess of blasts in transformation. Note the signs of abnormal maturation such as vacuolation, double nucleus, and macrocytosis. Courtesy of U. Woermann, MD, Division of Instructional Media, Institute for Medical Education, University of Bern, Switzerland. Bone marrow film (1000× magnification) demonstrating granular and clotlike positive reaction in periodic acid-Schiff staining in a refractory anemia with excess of blasts in transformation. Courtesy of U. Woermann, MD, Division of Instructional Media, Institute for Medical Education, University of Bern, Switzerland.